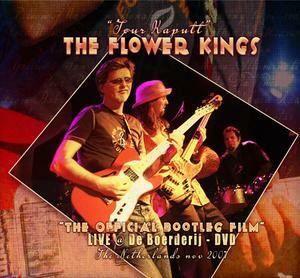 Great news for fans of The Flower Kings: the new DVD which has been announced a few months ago is now available for pre-order from Reingold Records. The DVD has been titled “Tour Kaputt” and contains the live show that was recorded in 2007 at the Boerderij in Zoetermeer in The Netherlands. The show features drum maestro Pat Mastelotto (King Crimson, Mr. Mister) and has a running time of 142 minutes. The live recordings are also available on double-CD. For the real die-hard Flowerheads, Reingold Records is offering a package deal with a discount if you order both the DVD and the double-CD.